Volvo Penta has expanded its IPS (Inboard Performance System) range with the release of the new D8-IPS700 and D8-IPS800, extending the benefits of IPS to an even wider variety of boats. The new D8-IPS700 (550hp) and D8-IPS800 (600hp) engines are a 7.7L inline 6-cylinder engine perfect for twin and triple installations. Both are available with the EVC E3 electronic platform to communicate with the engine management system, power is delivered via a twin-entry turbocharger, mechanical supercharger and a Common Rail fuel injection system. 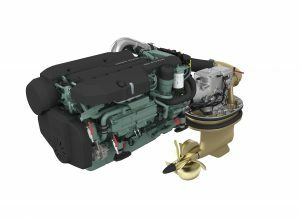 The engine is perfectly matched to the IPS15 pod for optimal performance, reduced drag and noise levels for onboard comfort – perfect for 45-55ft motor yachts. Volvo Penta has released the new D8-IPS700 and D8-IPS800, enabling IPS to be used on a further range of vessels. The D8 in the model name aligns itself with the D8 engine; the IPS700/800 representing the equivalent shaft drive horsepower required. When first launched 10-years ago, Volvo Penta’s IPS set new standards in precision and responsive steering, and delivered the best maneuverability in the industry. Over the past decade, Volvo Penta has remained at the forefront by continuing to enhance the maneuverability of its systems through the introduction of Joystick Docking, Joystick Driving and Dynamic Positioning System. Now even docking and close-quarter maneuvering can be performed with just your fingertips. Steering out at sea can be done with one hand, at any speed, with perfect precision and minimal effort. At the push of a button, a boat can hold its position and keep within a very limited area thanks to Dynamic Positioning System – perfect for when waiting to dock, refuel or for a bridge to open. IPS’ forward facing, propellers operate in undisturbed water while the twin counter-rotation results in improved efficiency and performance. In fact propulsion efficiency during middle and top speeds is improved by 25-35% compared to traditional inboard shafts. The system’s improved efficiency also results in 20% higher top speed, 30% longer cruising range and 15% faster acceleration. Furthermore both fuel consumption and CO2 emissions are reduced by up to 30% compared to inboard shafts. To date over 20,000 IPS units have been delivered to 550 boat builders and feature in around 1,100 different boat models. Caption: Volvo Penta has released the new D8-IPS700 and D8-IPS800, enabling IPS to be used on a further range of vessels.